Can you help identify the man on the right? 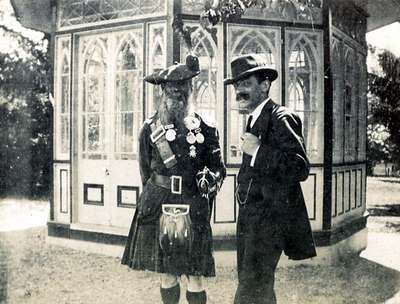 Black and white photo of Donald Scott in Scottish Dress with a bagpipe, next to an unidentified man in Prospect Park, Oshawa. Prospect Park was owned by Eli Edmondson, and the site was later taken over by R.S. McLaughlin for his Parkwood Estate.